The Society came into being at a time of microbiological ferment some seventy years after the microbiologists of the late 19th Century created a similar level of ferment showing that the microbial world is important. The interactions of new understanding brought a need for consultation, cooperation, and publication so specialized scientific societies were founded and burgeoned over the 20th Century. The 1930's brought changes and new areas of research and development despite the rigors of the depression years, e.g., increased awareness of bacterial physiology, the cultivation of influenza virus, and the sulfonamides. After 1945, research activities accelerated remarkably due in part to the stimulus from wartime and the solution of problems by interdisciplinary cooperation. A remarkable decade, 1945-1955, resulted with a burgeoning of novel researches and discoveries, to which we owe the present-day excitements in molecular biology, and an infusion of young scientists of varied backgrounds becoming aware of new biological fields to conquer. 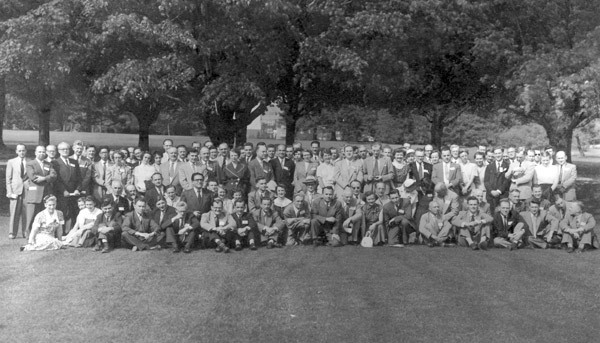 The first annual Meeting of the Society was held in Montreal in June 1952. They started with the promising support of the 175 persons who attended (including representation of seven provinces) and a meeting that showed a profit of $20.00. From this start we developed a formal membership of 182 by 1952 and of 380 by 1954. The prime objectives were encouraging membership, finding a way to start a journal, and organization of annual meetings. Incorporation of the Society required evidence of a degree of maturity and secure establishment, with a formally accepted constitution and a set of by-laws. This was finally attained in 1958, which marked the official year of foundation. What we gained from these early years was the experience of warm and friendly gatherings with open and remarkably full discussions of high quality papers. Our meetings were held from coast-to-coast even if there were a few more in the central provinces than on the east or west coasts. They were lively events with a "family" feel to them, as there is still, and there was fun to be had at the banquets and social events. From the beginning Graduate Students and Post-doctoral Fellows were made welcome and indeed, more then ever now, laboratories sent as many as possible of their number to the meetings whether or not they were to give a paper. Also it was important that they could attend papers outside of their own specialties because of great symposia and few concurrent sessions. In fact, it was this "atmosphere" that had a lot to do with the success of the Society and we should hold on to the elements that encourage it.